BMW is sticking with plans to open a new factory in Mexico in 2019 despite warnings from President-elect Donald Trump that he will slap a border tax on cars imported from the country. The German automaker's head of sales and marketing, Ian Robertson, told Richard Quest of CNN that BMW is committed to the factory in Mexico. Robertson explained that the company needs to expand manufacturing beyond its U.S. factory in Spartanburg, South Carolina, already the biggest BMW plant in the world. "We need additional capacity, so we have chosen to build a plant in Mexico," he said. The Spartanburg plant produces up to 450,000 cars per year, he said. "In a global setup, this is normal business," he said. "At the end of the day, our commitment to the U.S. is strong." Trump has publicly threatened automakers with a tariff on Mexican-made cars that are sold in the U.S. In recent weeks, he has specifically called out Ford (F), GM (GM) and Toyota (TM). Last week, Ford scrapped plans to build a new $1.6 billion Mexican plant. CEO Mark Fields said the decision was made "independently" and it had not made a special deal with Trump. Trump responded with a "thank you" tweet to Ford. "This is just the beginning - much more to follow," he said. BMW has already started work on the new factory in San Luis Potosi, Mexico. 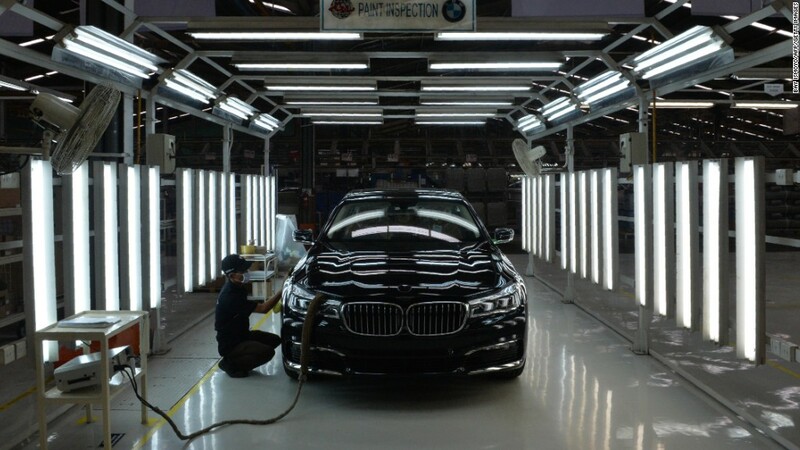 The facility will open in 2019 and produce the BMW 3 Series Sedan. BMW says the factory will create at least 1,500 new jobs. "The cars which will be produced in Mexico are for the global market, not only North America," the company said. The German automaker has more than 30 factories in 14 countries around the world. The South Carolina plant employs 8,800 people and is investing $1 billion to increase production capacity. About 70% of cars made there are exported globally. BMW sold nearly 370,000 cars in the U.S. last year.